In order to stay healthy, you have to eat a variety of nutritious foods every day. 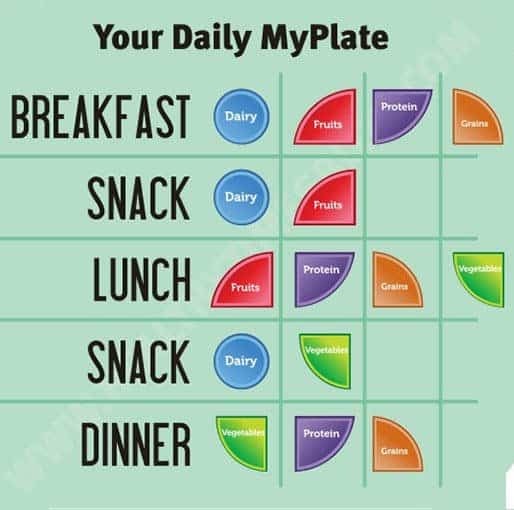 It’s not that easy to eat healthy though, and that’s where the Food Guide Pyramid can help you out! The Food Guide Pyramid is an easy way to learn about healthy eating. Just think of it as a puzzle of nutrients that your body needs every day, and the five major food groups are the puzzle pieces. Milk (3-4 servings) – Foods include milk, yogurt and cheese. The key ingredient is calcium, which builds strong teeth and bones. Fruits (2-4 servings) – Fruits are excellent sources of vitamin C, which heals cuts and keeps skin healthy, and fiber, which helps your digestion. So stock up on fruits – fresh fruit, dried fruit, frozen fruit, canned fruit… they’re all good! Vegetables (3-5 servings) – Veggies are also great sources of fiber and vitamin A. Just remember that darker colored vegetables, like carrots and broccoli, have more nutrients. Meat (2-3 servings) – Foods include meat (beef, chicken, turkey, fish, pork but not bacon), beans and nuts. This group provides iron and protein, which gives you strong muscles. Grains (6-11 servings) – This food group gives you energy because it contains carbohydrates. Includes breads, cereals, rice and pasta. The Food Guide Pyramid is updated every five years. When it was last updated in January 2005, the biggest change was to increase your intake of fruits, vegetables, grains and milk. Eat 2 cups of fruit a day. Eat 2 1/2 cups of veggies a day. Eat 3 or more ounces of whole-grain products a day. Drink 3 cups of fat-free or low-fat milk a day. The updated Guide now includes exercise guidelines that recommend you work out for at least 30 minutes a day. But, it also allows you to eat sweets such as chocolate and ice cream, as long as you get enough nutrient-rich foods in your meals! Food Pyramid – Did U Know? About 80% of Americans are aware of the Food Guide Pyramid, but only 8% follow its recommendations. Junk food, like chips, aren’t included in the food groups, which is why schools have removed them from their vending machines.